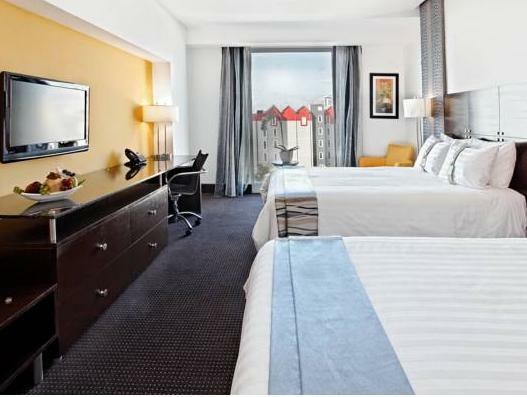 ﻿ Best Price on Holiday Inn Santo Domingo Hotel & Suites in Santo Domingo + Reviews! The Metro Bus Station and the Olympic Stadium are a short walk from this Santo Domingo hotel. The hotel offers the full-service Aromas restaurant and free high-speed internet access. At the Holiday Inn Santo Domingo Hotel and Suites, guest rooms boast a full kitchen with a mini-refrigerator and a stove. The rooms provide a CD/DVD player, pay-per-view movies and video games. A florist and a gift shop are on-site at the Santo Domingo Holiday Inn. An outdoor lighted pool and a fitness center are available at the hotel. The hotel features a convenience store and baby-sitting services. Foreign currency exchange is provided at the hotel. The National Aquarium is within driving distance of the Holiday Inn. Quisqueya Stadium and the Alcazar de Colon Palace are also located nearby.